My breed has been developed from a wide variety of different bulldogs and terriers, and through the years we have gotten much larger and stronger. We are very powerful and courageous. However, no matter how many bad things you might have heard about some of us, most of us can be excellent pets. We don't particularly like other dogs, but we can learn to get along with them if we're trained properly from an early age. We've gotten a lot of bad publicity lately because there are some folks who have taken advantage of us and used us for illegal dogfighting. I think that we can change our image if we have a little help from some good breeders who care about our future. Our original purpose was to be fighters and we were one of the most popular breeds during World War 1. Today a lot of us work as guard dogs because we look pretty scarey to burglars and we're very protective of our families. We can also be gentle and loving family members and companions if given the chance. When fully grown, I am between 18 and 21 inches tall (45.7 to 53.3 centimeters) and I weigh between 30 and 80 pounds (13.5 to 36 kilograms). We have no American Pit Bull Terrier Breeders listed at this time. 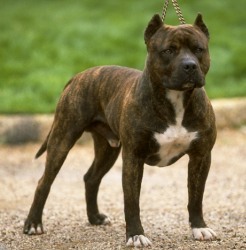 Click here to place your American Pit Bull Terrier Ad!